A session on growth hacking moderated by Apurva Chamaria, CRO, RateGain & best selling author filled with varied insights and perspectives of Siddharth Banerjee, EVP Marketing – Vodafone, Shoma Narayanan, Head – Marketing at HSBC India, Kartik L Jain, Executive Director -Digital Bank at DBS Bank, Ashish Khazanchi, Managing Partner- Enormous took place at the second edition of SAMMIE Best Social Media Brands 2018. All that you need to know! What is Growth Hacking for you? “For me growth hacking is how you shorten the first part of it; how you reach the belly curve, the belly of the market, the fastest. The basics of it don’t change. If you as a brand, deeply stand for something (ex- airbnb, shopclues), can you polarize the market to believe you as a brand? People become your media vehicle. That’s the easiest way to hack. Treat people as your carriers. Polarize the market. It’s about how you infect the people with your message and make it contagious,” said Ashish Khazanchi, Managing Partner at Enormous. A couple of years ago the industry saw a lot of pressure on marketers to actually talk about performance marketing and numbers. The traditional narrative around salience marketing somehow stopped cutting the eyes with CEOs, and along came a phase where people talked about ‘Our CMO is well equipped to run the company and what kind of skills are required in CMOs to stay relevant and one of them was growth marketing and growth hacking. “It led me to start talking to companies which we were worried about. Most of us have worked with large companies all our lives. The industry was challenged by nimble agile competitors. For every Taj hotel you have an Oyo, for every MakeMyTrip you had a small OTA and so on. I spoke to a lot of marketers to figure out what’s changing in the world of marketing,” Apurva Chamaria, CRO, RateGain & best selling author said. Is there a role for growth hacking in otherwise traditional industry like financial services and banking? “I have done my career in FMCG and there marketing or branding was part of the PNL, was used to pull customers at retail touchpoints. For banking its a push based product and typically the focus is on the branch or RM interaction campaigns. And why its is important to have growth hacking there is because the CFO is the bin counter that you have to get past if you have to do big in a typical time unless they are investing consistency in the plan. That’s the challenge,” Kartik L Jain, Executive Director -Digital Bank at DBS Bank elaborated. He further stated that as a marketer, we really have to decode what marketing does and what it can do for typical conventional bankers who are not so familiar with traditional marketing. Furthermore, the environment is changing so fast, what worked earlier may necessarily not work now and it’s more important for traditional marketers to how do we evolve and start doing things differently. Unless you are very sure, even though you have the budget, you can’t risk a large bet. So, it’s always better to test and learn doing small things and then scale the market. 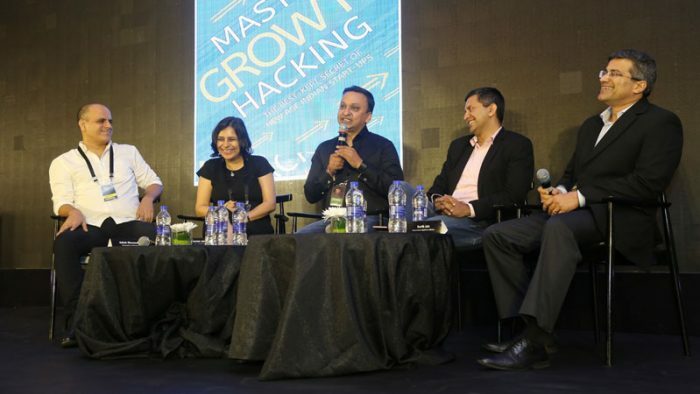 According to Shoma Narayanan, Head – Marketing at HSBC India, growth hacking is something which will help many companies even in traditional industries become even more customer centric then they have usually been. “As far as the customer is concerned, your competition is now no longer someone else in your industry. Most competition comes from an area where you least expected from. For a customer who has 8 apps in her/her phone which they use regularly, your competition now in terms of an user experience is not really one bank vs/ another. Its BookMyShow, Paytm and social apps like Facebook. Secondly, the closest you can get to ROI is by using techniques such as programmatic, creative optimizations to get the right message in the front of the right customer and that increases your chances of an actual sale. So for banking a credit card product is where you can complete most of the sales online and you see huge improvements once you bring these technologies into play,” Narayanan added. Growth has been very frugal which has led to non-linear growth. According to Siddharth Banerjee, EVP Marketing – Vodafone, in today’s digital world where everything is super connected, marketers, agency partners, and customers have opportunities to get to know something or to adopt something very fast. The linear model has now become a noodle where literally you can know about something new. You can try it a very low risk and can also Read user opinions and reviews and then try it. “Disruption today is coming from any part. So the next big idea can disrupt anything. Growth hacking provides an opportunity to us to connect to consumers in a very short period of time to drive towards a desired marketing or business objective. Ex- Vodafone’s #LookUp on digital platforms and social media to increase brand love; done frugally, reached 230 million people whereas we have a customer base of 215 million; therefore, high reach at low cost.,” Banerjee added.